The Woodland culture period began at about 1000 B.C. The Woodland Indians came after the Archaic Indians, so they perfected many of the ideas and inventions created by the Archaic Indians. The Woodland culture period was the time in which families and small groups of people began banding together and creating tribes. A tribe is a group of people who share a common ancestry, name, and way of living. The tribes that the Woodland Indians created required villages that would be able to house many people. Consequently, some of the homes that the Woodland Indians built were quite different from the houses built by the Archaic people. Traditionally Eastern Woodland Indians lived in dome-shaped homes called wigwans or longhouses. Wigwams are made of a wooden frame covered in woven mats and sheets of birch bark. In fact, wigwams are often called birch bark houses, due to the large amount of birch bark sheets used when building a wigwam. Once the birch bark is in place, ropes or even strips of wood are wrapped around the wigwam to hold the bark in place. The end result is a small house, which is usually between 8 to 10 feet tall. Overall, wigwams are small and easy to build. Unfortunately, they are not portable, so Woodland Indian families would have to build new wigwams every year when they set up their winter camps. 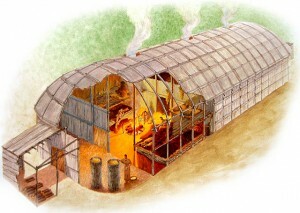 Longhouses are built similarly to wigwams, since the construction of a longhouse requires pole frames and an elm bark covering. The main difference is that longhouses are much, much larger than wigwams. 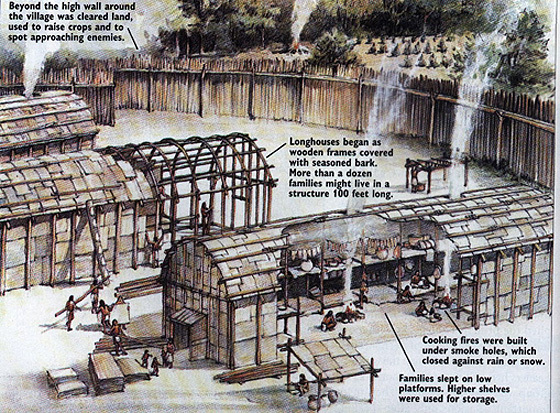 Longhouses can be up to 200 feet long, 20 feet wide, and 20 feet high. Inside the longhouse, raised platforms created a second story, which was used for sleeping space. Mats and wood screens divided the longhouse into separate rooms. Husbands and fathers were the main builders of these houses, but older children were allowed to assist with the project, so that they would also learn how to construct houses. The women did not usually build the houses, but they help with the project, because they usually gathered the supplies that were used in building the houses. Along with teaching their sons about home construction, fathers also taught their sons how to hunt and farm. The Bow and Arrow: The methods of hunting greatly changed during the Woodland Indians period, since the bow and arrow was introduced to Native Americans. Archaeologists don't know who invented the bow and arrow, but one thing is for sure. Due to the bow and arrow, hunting became much more efficient. Imagine someone is hunting a white-tailed deer through a forest. Deer are always wary, and are very careful to not let people get too close. Armed with a hand-held spear, a hunter must move quite close to be within range. The snap of a single dry twig and the deer runs out of range. With an atlatl, the hunter does not need to be so close, but stalking the deer is still difficult, and it requires more room to maneuver. With a bow and arrow, the hunter does not have any of these problems, since a bow and arrow is powerful, compact, and is a long range weapon. Unfortunately, the bow and arrow also increased the amount of inter-tribal warfare. There were many Woodland tribes including, but not limited to: Lenape, Iroquois, Massachusett, Powhatan, Abenaki, and Mohawk. The inter-tribal warfare could be quite harsh, so many villages were fortified with fencing, that was reinforced by dirt. Farming and horticulture in general, was improved by the Woodland Indians. They were able to grow such things as squash, wild greens, and sunflowers. As seen in the picture above, Woodland Indians improved their horticulture abilities and were now able to clear large plots of land for farming and village expansion. Religion and Beliefs: The Woodland tribes believed in animism. Animism is the religious idea that the universe and all natural objects have souls or spirits. In this religion it is believed that souls or spirits exist not only in humans but also in animals, plants, trees, rocks, and basically anything that exists in nature. This belief also states that natural phenomenon like thunderstorms and rain showers also have spirits. Woodland Indian warriors wore face paint on their faces to not only scare their enemies, but also to keep evil spirits and demons away.